I'm in San Francisco for the Google I/O conference. 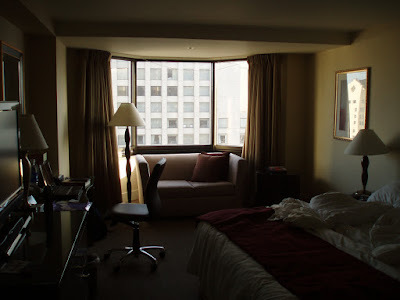 I arrived at SFO airport last night around 22:30 and took the BART train to Powell St. station, and after a little wandering around found the Parc 55 Hotel I'm staying at with help of some fellow travelers who also happened to be staying at the same hotel. 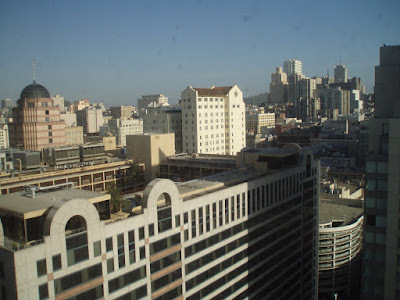 I woke up this morning to the pretty San Francisco skyline out my 24th floor window. I plan to check out the city with Colter Jacobsen and/or Jason Holt after I'm done with some phone meetings this morning. There are lots of wireless networks visible from here, many labeled "free" in various ways, but I wasn't able to use any of them except the $13/day Parc 55 wireless. Probably a result of being so high up.